You will fall in love with its goldielooks. Gorgeously simple to look n cook and easy to digest. 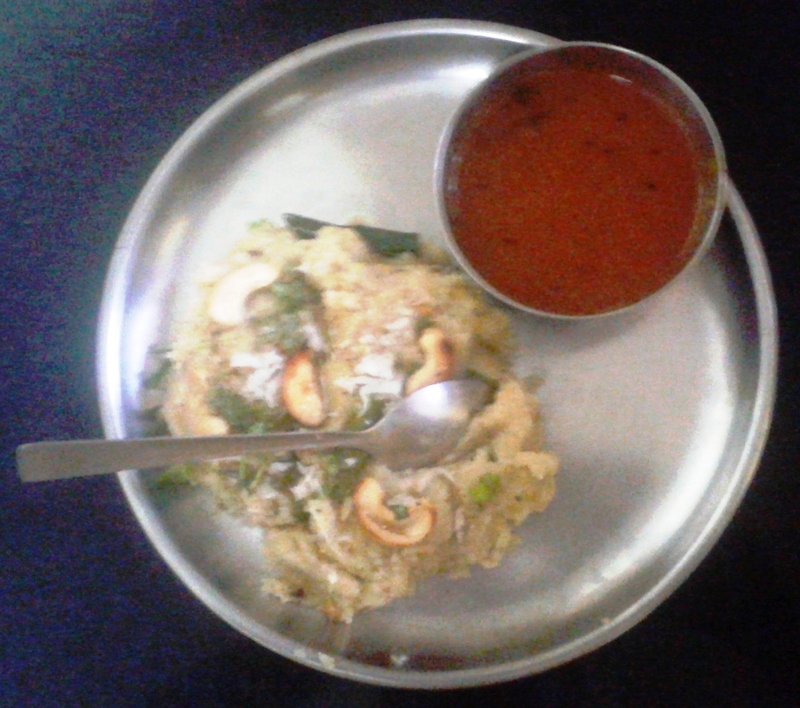 Rava Pongal is a traditional South Indian breakfast dish prepared especially during harvest season. Popular as prasadam in temples and a favourite during festive occasions. Green gram dhal is a ‘must use’ ingredient for any pongal. While it is normally cooked with rice, here is its cousin Rava that takes its place to regale you with a relishing recipe. Green chilly (slit) 1 no. Wash ginger, green chillies and curry leaves. Drain the water. Grate or fine chop ginger. Crush pepper corns. Cook moong dhal in a pressure cooker along with ingredients listed above for cooking. Dhal should be well cooked but not mushy. Dry roast rava in a pan on low flame till you get a nice aroma. Switch off the burner and let rava cool. Finely chop washed and drained fresh coriander leaves and keep aside. Cut cashew nuts into pieces and keep aside. Keep water for boiling. Now prepare the seasoning. Heat ghee in a kadai and prepare seasoning. Put jeera, pepper corns, cashewnut pieces, slit green chillies and curry leaves (in that order at few seconds intervals). Saute them for a few seconds. To this seasoning, add the roasted rava slowly and roast it further along with the seasoning. Add ½ tsp salt and mix thoroughly. Now add cooked moong dhal and then boiled water slowly to prevent rava from forming lumps. Mix them thoroughly, cover with a lid and let it cook for 5 to 10 min. 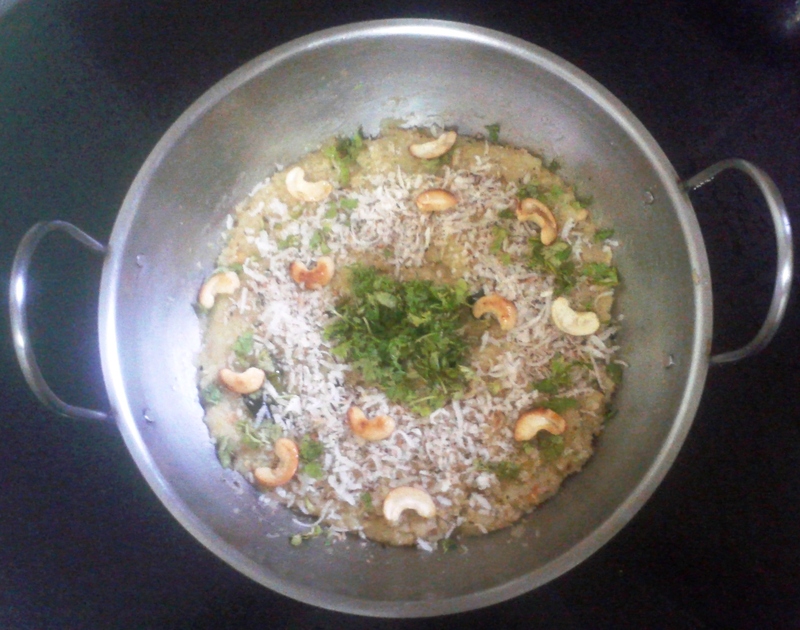 At the end garnish with grated dry coconut, finely chopped coriander leaves and fried cashewnuts. Rava Pongal is now ready. Serve it hot with gojju or coconut chutney or sambar. Also view “Tamarind Gojju” in this blog. It makes an ideal side dish for Rava Pongal. Rava is a South Indian term for Sooji or Semolina. A variety of savouries and sweets can be prepared using Rava. Rava is low in fat. The carbohydrate content in Rava is a rich source of fuel for our tissues. Protein content in Rava nourishes our muscles and skin. Folate content in Rava supports the production of red blood cells. A serving of Rava contains approximately 5 -5.5 gms of protein and 105 – 110 micrograms of folate. Based on the texture and type of wheat, varieties of Rava are available including Superfine Rava (also known as Chiroti Rava), Medium Rava, Bansi Rava or Lapsi Rava etc. Rava that is made from Durum Wheat is yellowish in colour whereas those made from softer type of wheat are off white in colour. Durum is the hardest of all wheat types. Harder the wheat, higher is its protein and gluten content.